alaTest har samlet og analyseret 404 anmeldelser fra magasiner og hjemmesider. Mange kan virkelig godt lide skærmen. Også præstationen imponerer, men folk er mindre positive med hensyn til kameraet. Vi analyserede bruger- og ekspertratings, produktalder og andre faktorer. 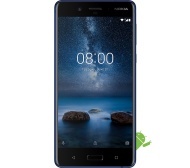 Sammenlignet med andre Mobiltelefoner får Nokia 8 en samlet alaScore™ på 92/100 = Fremragende kvalitet. Nokia 8: Price, release date. features and price – Is this the Nokia HMD flagship device we have been waiting for? Or will it end being too expensive? Some people have been waiting an awful long time for Nokia to make an Android phone. If we used the Nokia 8's Bothie mode to shoot a reaction to the phone, it would be all smiles. This is it then. The long-awaited Finnish flagship that goes all in against the phones that rule today. The Finnish cameraphone returning to claim the prize that was once its birthright. Everybody bow and make way? The Nokia 8 is fine. And that's its biggest problem. The Nokia 8 has two rear cameras and is packed with power. Its screen is bright and sharp. It lacks some cutting-edge features for a high-end phone in 2017, like waterproofing and a slim, standout design. A decent all-rounder, the dual-camera Nokia 8 gets the job done, but it doesn’t come close to today’s true Android stars. Hands on Nokia 8 review: Is this the Nokia flagship we've been waiting for? Nokia 8 is a stellar device from HMD Global and it almost checks all the right boxes for the first Nokia-branded flagship. But here is the thing, ‘almost'.